College students have a wide array of language skills. College success and career readiness depend upon strong speaking skills and the ability to communicate well in print. 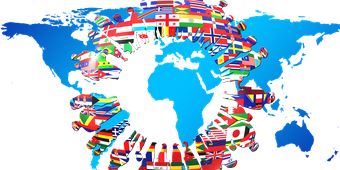 English and second language acquisition prepare students to engage in a globally-connected world. This is an elementary Latin course accompanied with a detailed grammar based upon Kennedy's Public School Latin Grammar designed to introduce one to the world of classical languages. A basic understanding of grammatical terminology would be helpful; however, it is not required. Basic definitions of terms will be explained in Lessons 1 and 2, and later elaborated as needed. Miskitu Aisas! ("Speak Miskito! "), a language course in Wikibooks, is an elementary introduction to the Miskito language, spoken in parts of Nicaragua and Honduras. The course focuses primarily on presenting the grammar basics through carefully graded and didactically presented lessons. Miskitu Aisas! assumes no prior knowledge of the language and no specialised knowledge of linguistics, although at least a general background in "school grammar" will no doubt be helpful, as will any previous experience at learning foreign languages. This Wikibook aims to teach the Spanish language from scratch. It will cover all of the major grammar rules, moving slowly and offering exercises and plenty of examples. It's not all grammar though, as it offers vocabulary and phrases too, appealing to all learners. By the end, you should be able to read and write Spanish skilfully, though you'll need a human to help with listening and speaking. This book is for students who have studied Modern Standard Arabic (MSA) for one year or more and would like to learn colloquial Arabic basics using their knowledge of MSA. It aims at transitioning learners from Novice Mid level to Intermediate Low through presenting situations useful for living in an Arab country. The book has several features including hyperlinks, practice dialogues with open answers, cultural tips, and more. This subject is the second semester of four that forms an introduction to modern standard Chinese, commonly called Mandarin. The emphasis is on further developing students' abilities to participate in simple, practical conversations on everyday topics as well as enhancing their abilities on reading and writing. The relationship between Chinese language and culture and the sociolinguistically appropriate use of language will be stressed throughout. A typical class includes performance of memorized basic conversations, drills, questions and discussion, and various types of communicative exercises. At the end of this course, students are expected to develop an understanding of the language learning process so that they will be able to continue studying effectively on their own. Guides a learner who has no previous German experience to gain the ability to accurately understand formal written German prose, aided only by a comprehensive dictionary. Specific objectives include: 1) Explain enough grammatical and syntactical information about the German language to enable you to read any desired text with the aid of a dictionary. 2) Explain elements of word formation to accelerate the process of learning vocabulary. 3) Lead you through practice in small-scale translation as the necessary foundation for dealing with more complex readings. Liberté, by Gretchen Angelo, is a first-year college French textbook with a true communicative approach.Each chapter is built around communicative strategies. Clearly dened objectives in communication, culture, and grammar are given at the start of each chapter, and summary exercises at the end allow students to measure their mastery of these objectives. It has been adopted by instructors at over twenty-five colleges and high schools. Gretchen Angelo teaches French language and literature at California State University, Los Angeles. This textbook is designed for students who have intermediate competency in Japanese, roughly at Level 2 on the ILR (The Interagency Language Roundtable) proficiency scale, and are working on reaching Level 3. This textbook can be used for self-study, as part of online course, and in a traditional classroom setting. It is comprised of four chapters, intended to be covered in one term of a quarter system. Yoruba Y Mi is an interactive, communicative, introductory, multimedia program intended to provide college/university students with basic listening, speaking, reading, and writing skills of language learning in Yoruba. It exposes the learner not only to Yoruba language in meaningful situations but also to the culture of the Yorb-speaking people of South-western Nigeria. It contains effective techniques for teaching and learning Yorb including tones, and is user-friendly in its approach.